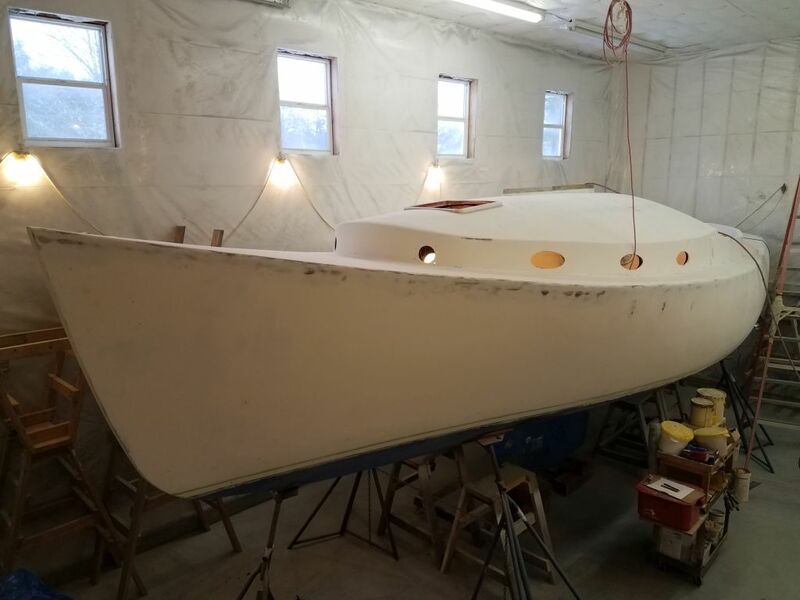 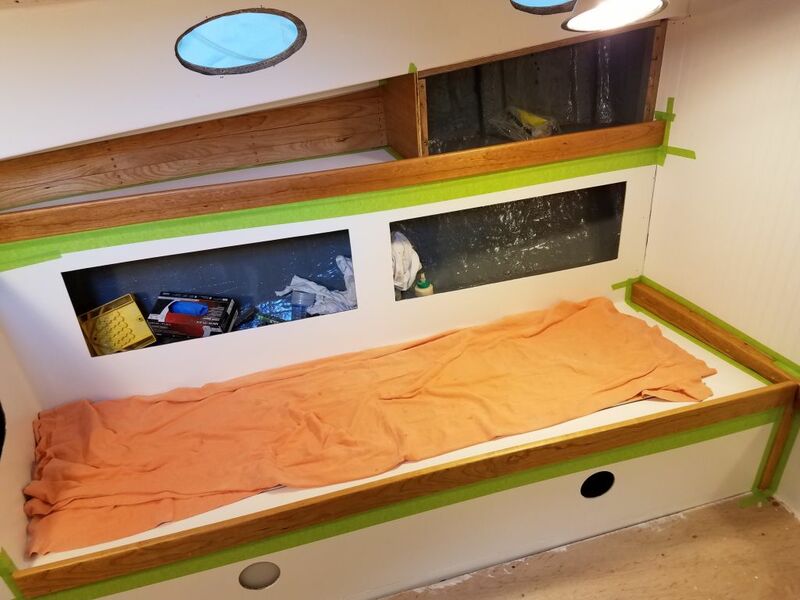 Because of unforeseen circumstances during the week that forced my absence from the shop, I’d fallen behind where I’d hoped to be, especially with the interior varnish, so I planned to make up some time and progress over the weekend. 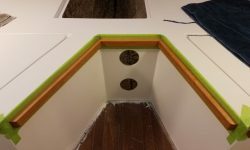 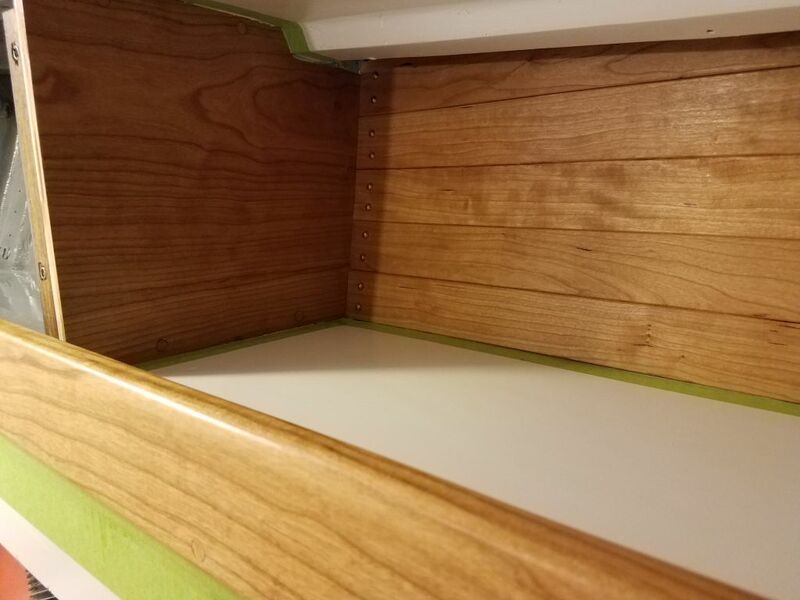 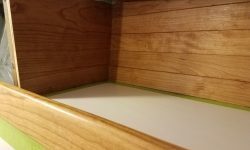 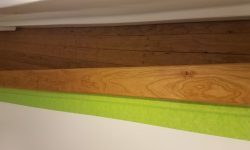 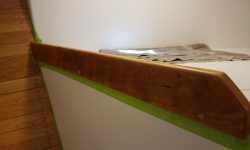 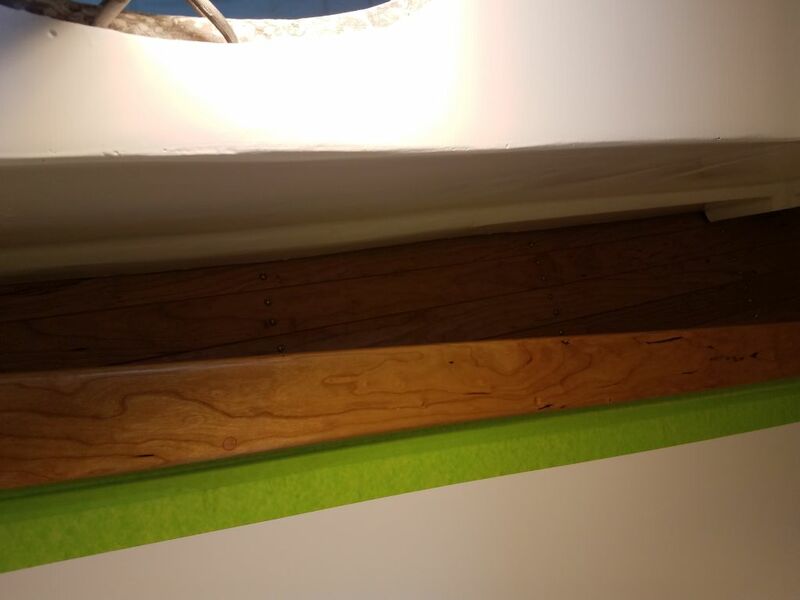 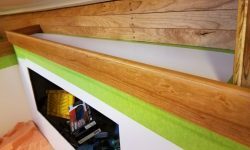 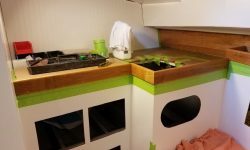 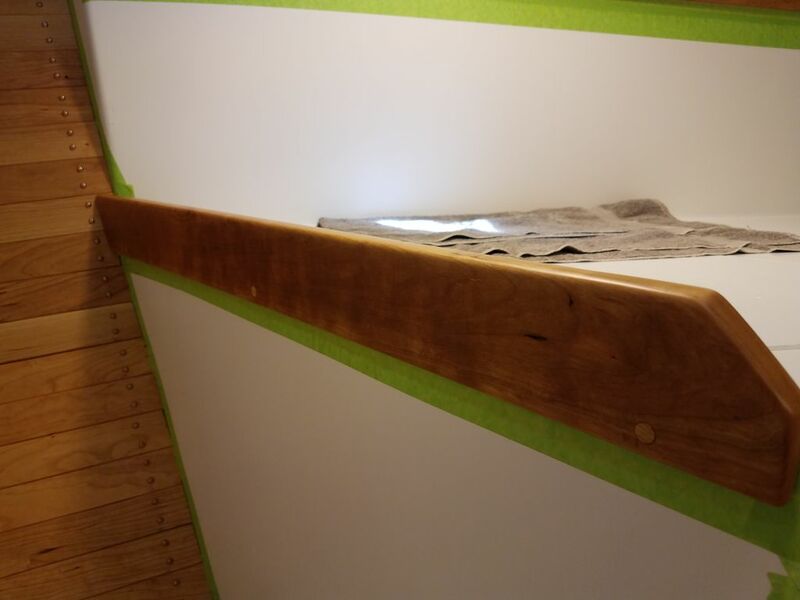 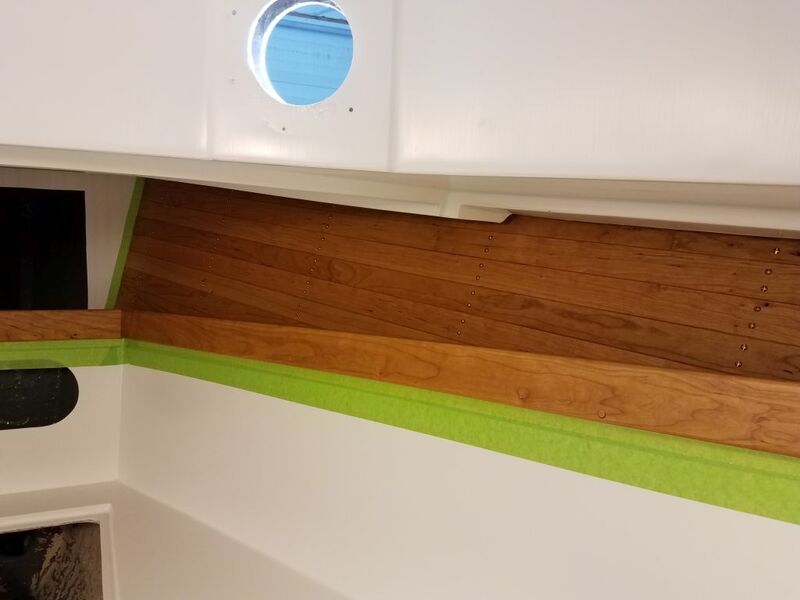 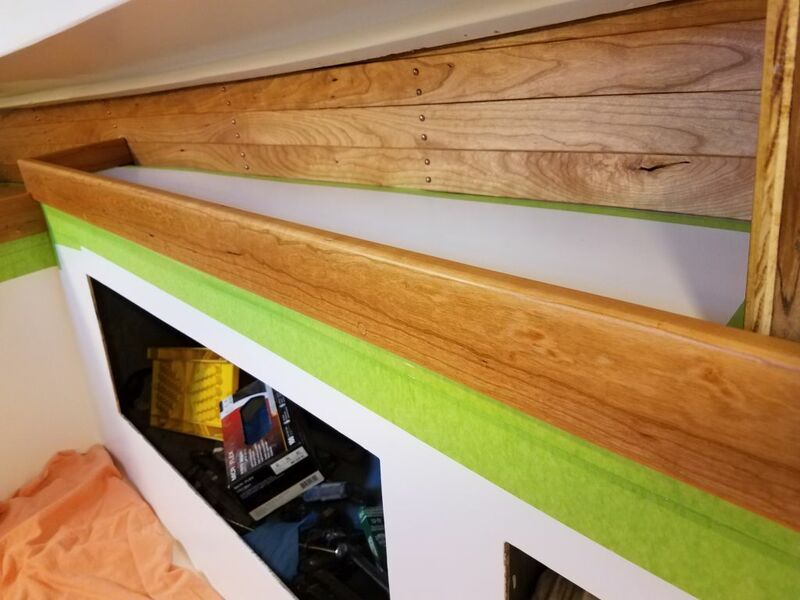 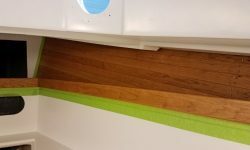 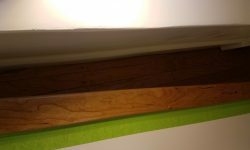 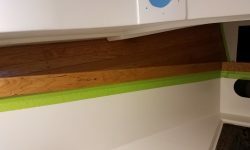 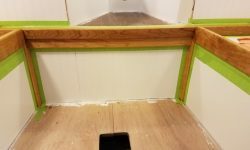 With 4-5 good coats of gloss base varnish on all the trim, all that remained was a final coating of satin varnish to complete the work on the trim installed so far. 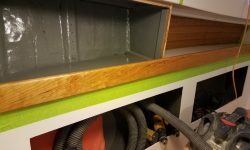 After the usual sanding and cleanup, I applied the satin finish. 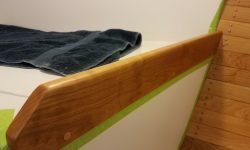 Later, once the varnish had a chance to dry, I took photos of the results, which looked good, though I planned a careful final inspection before deeming the coating complete in these areas. 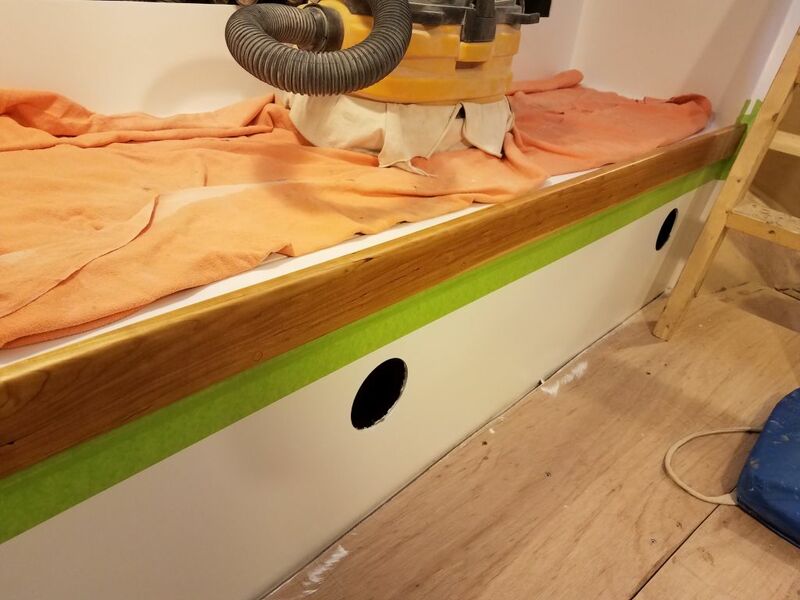 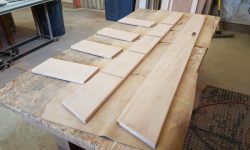 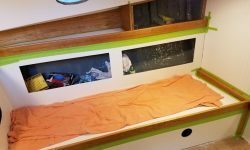 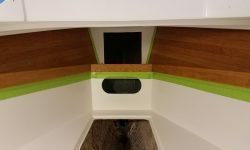 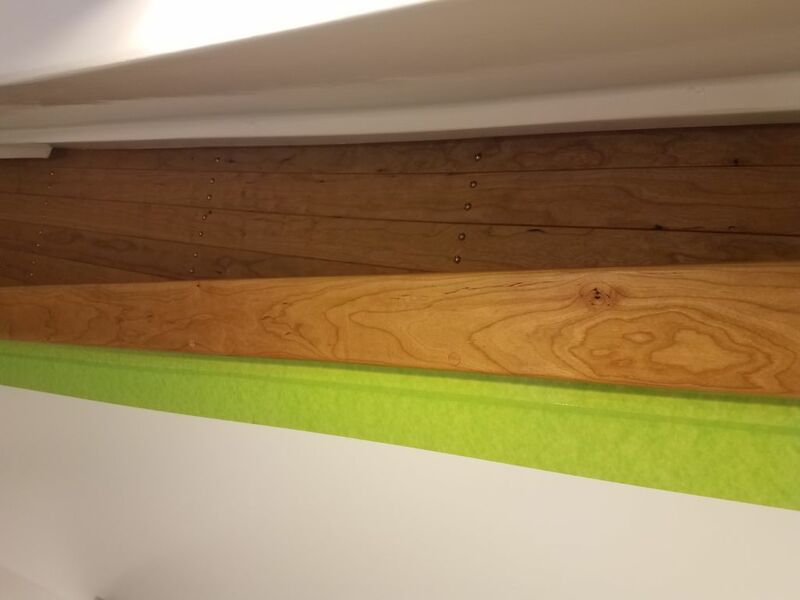 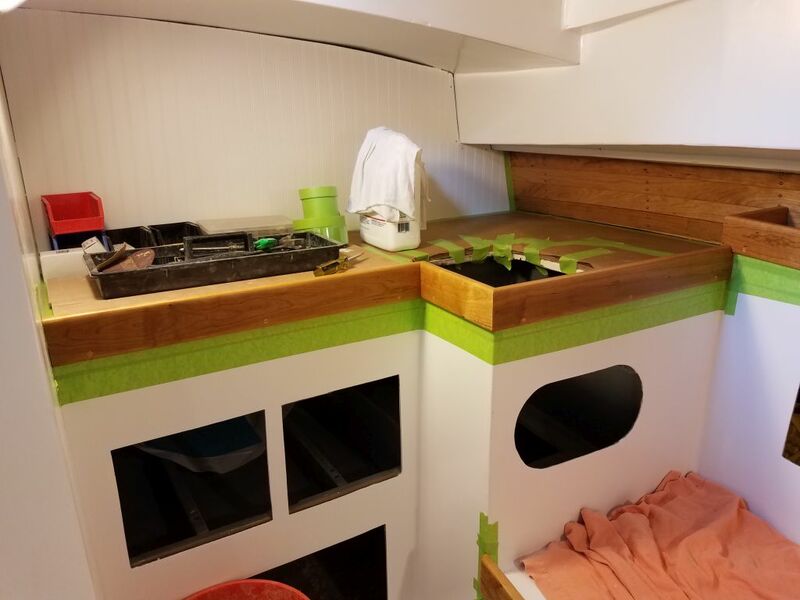 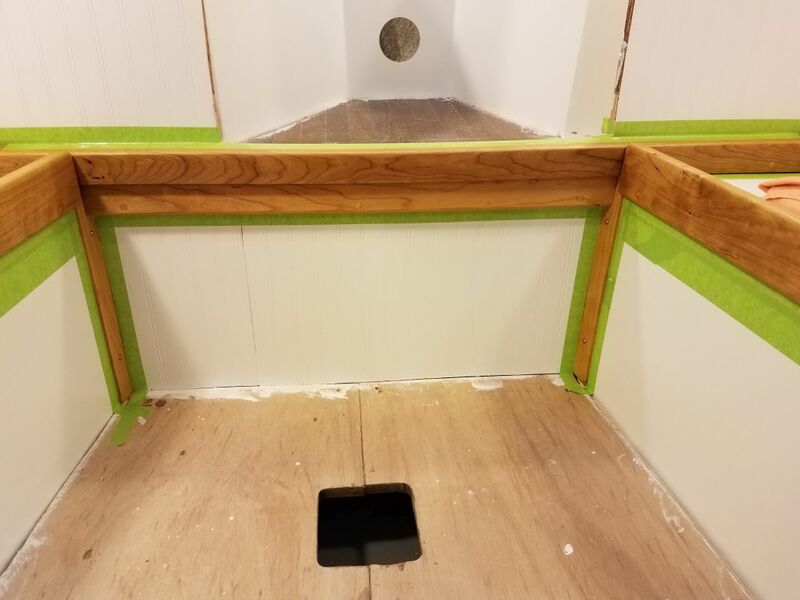 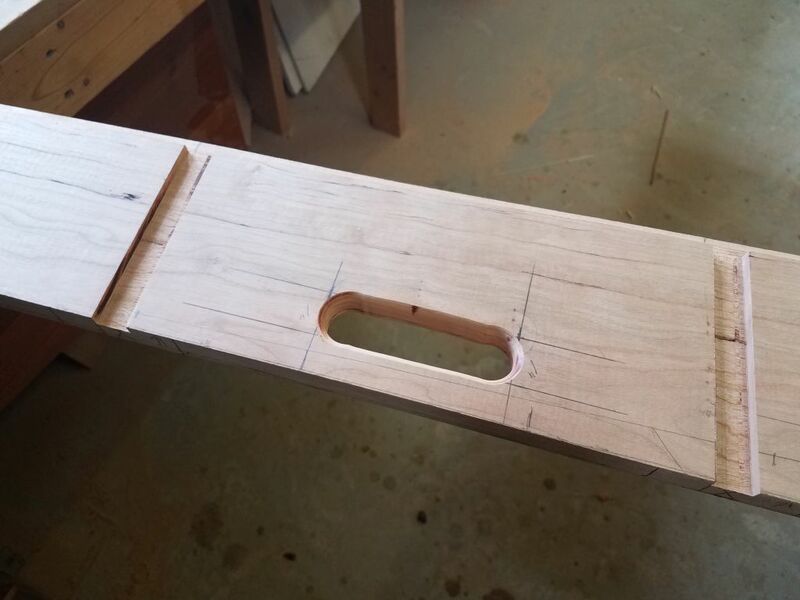 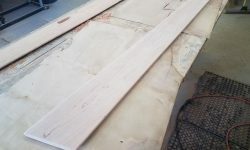 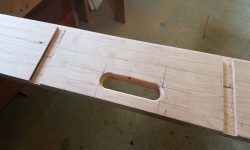 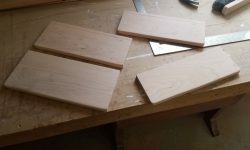 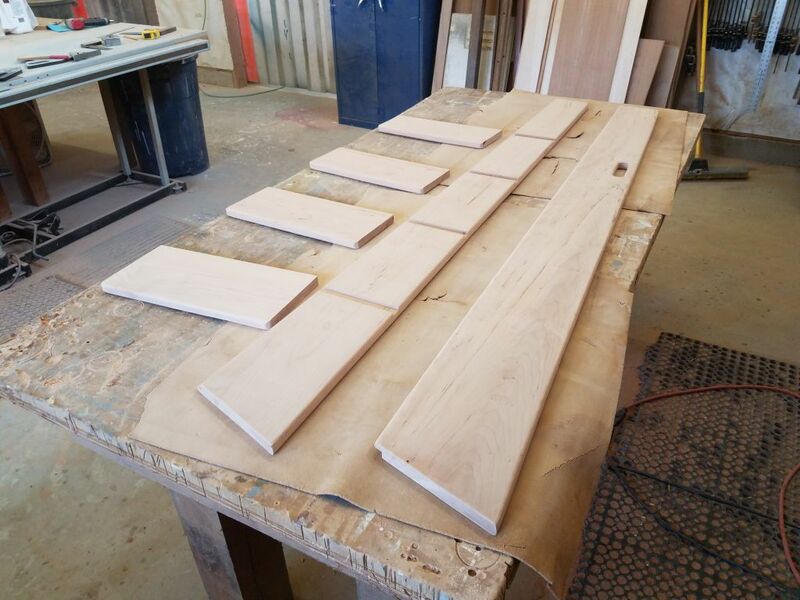 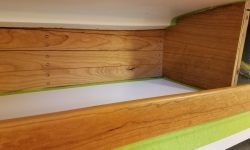 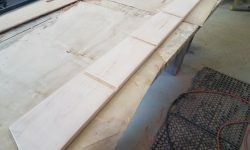 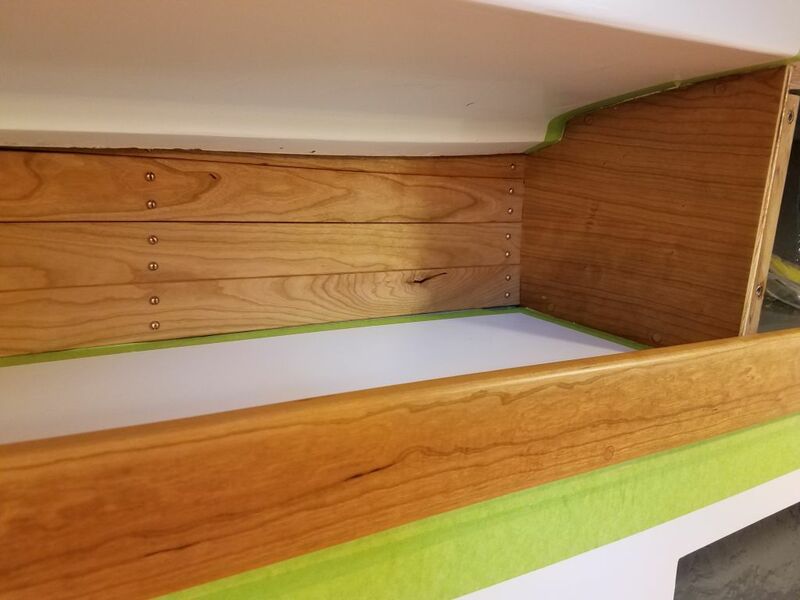 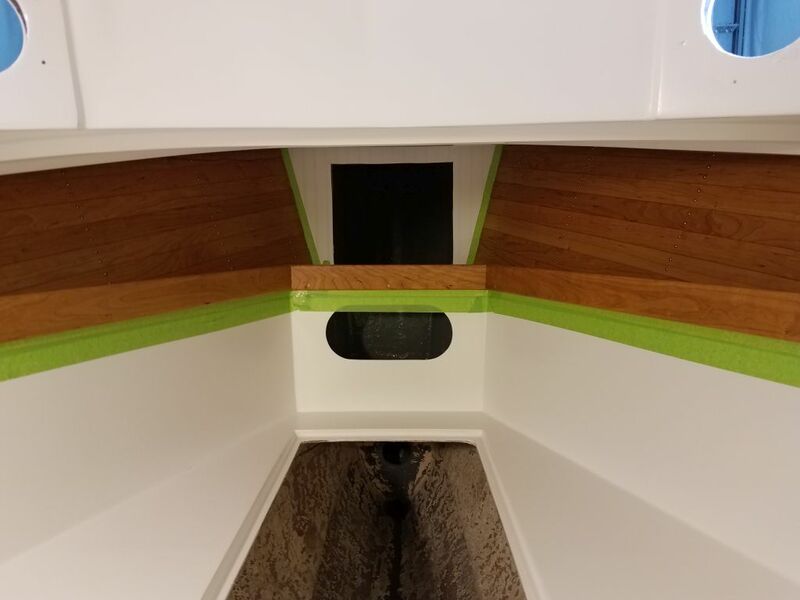 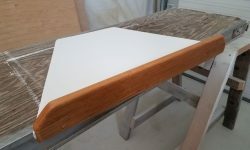 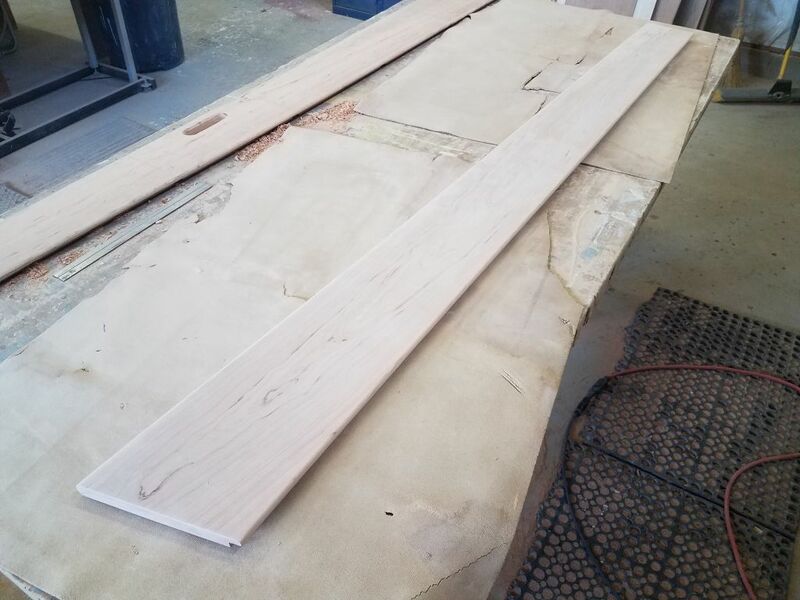 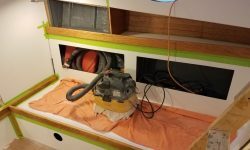 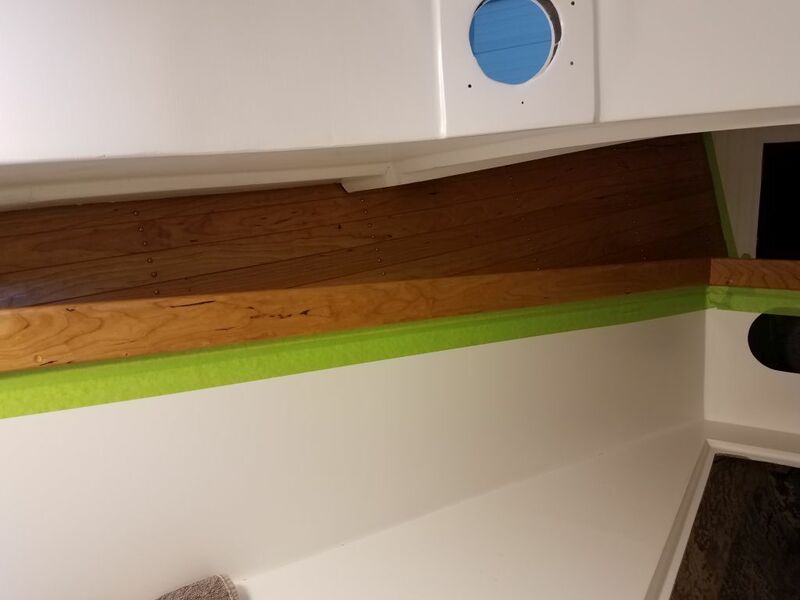 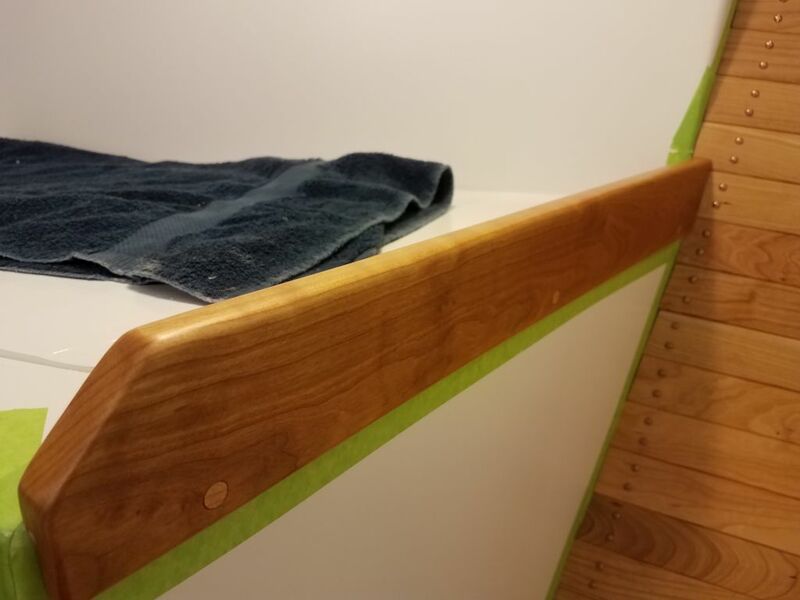 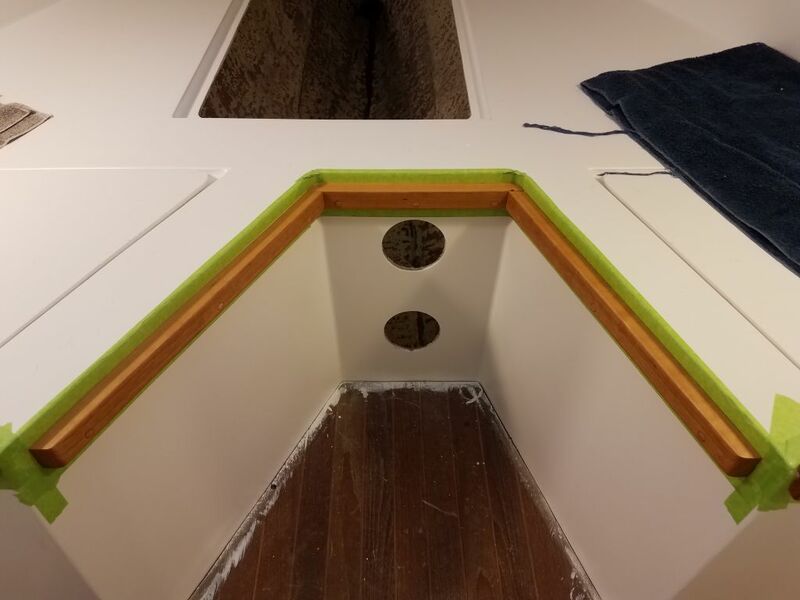 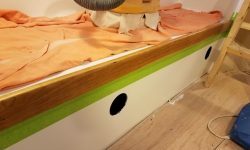 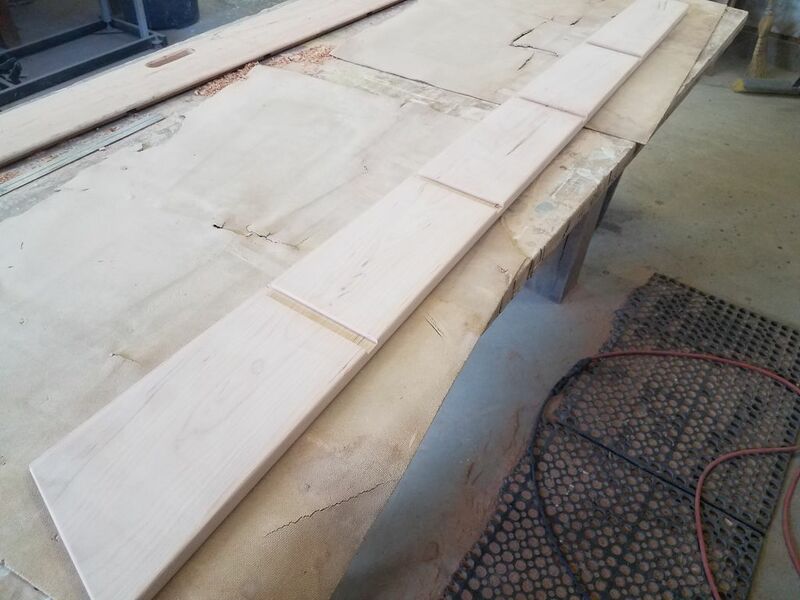 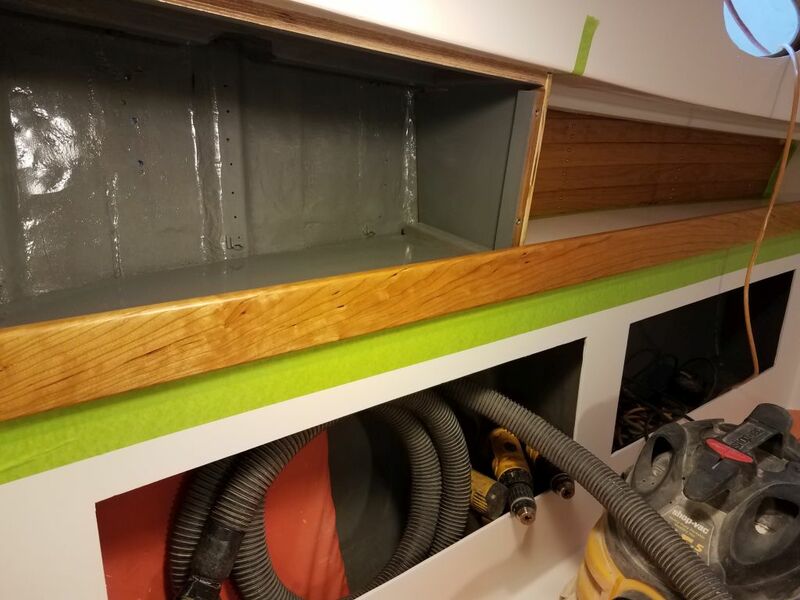 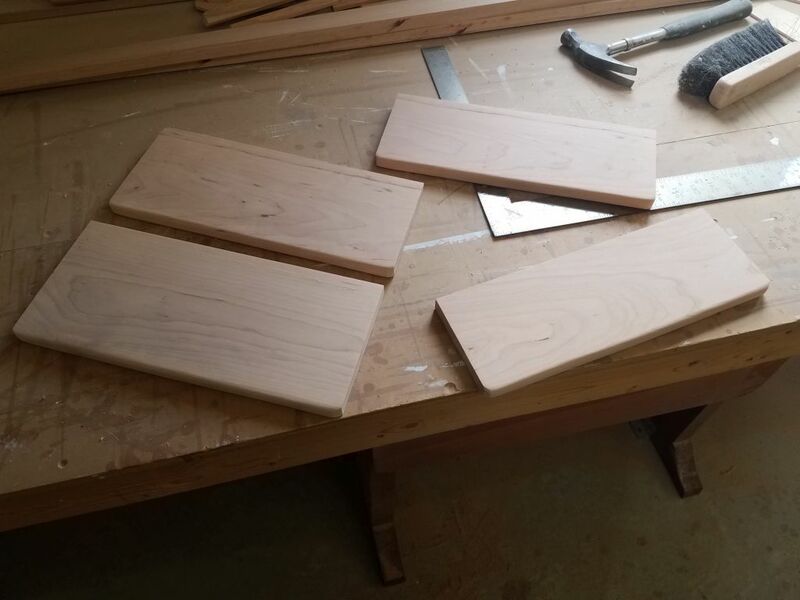 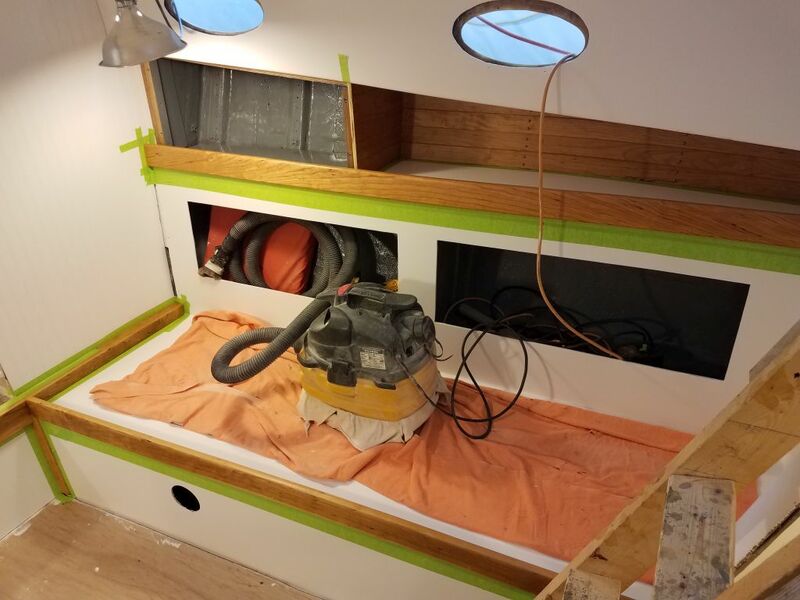 Now that I had all the basic pieces cut for the companionway ladder, I continued work on the new treads, trimming each to its final width (about 1/4″ deeper than the slots in each case, leaving a small overhang) and rounding the exposed outer edges for appearance and smoothness. 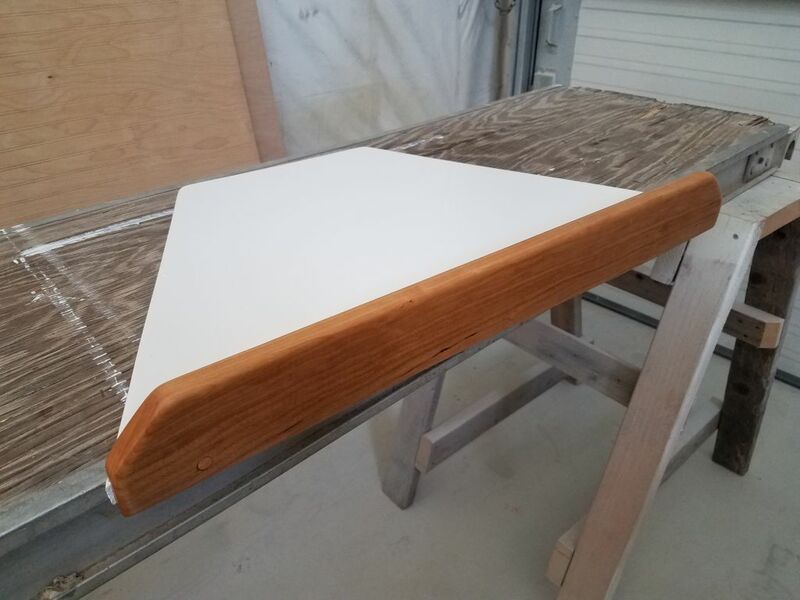 I cut the handhold slot in the outboard ladder rail with a drill bit and saw, and rounded the edges with a router before also easing the other exposed edges of the side rails accordingly, then sanded these parts smooth and clean as well, leaving them ready for final trimming (the side rails were still a few inches long at the top awaiting a final fitting) and ladder assembly next time.